Style: 400 different styles ! Random styles. How to use the Sticker: Clean the surface, then sticker on ,Use your imagination to create works. Sun protection and Waterproof ! Cute sticker. Detail Image. About your order 100pcs Sticker. Pls don't mind. Launch Distibutor. Launch Creader VI OBD2 Engine ECU Fault Erase Code Reader Auto Diagnostic Scan. Launch M-Diag for IOS/Android OBD2 Diagnostic Scan Tool Engine Fault Code Reader. 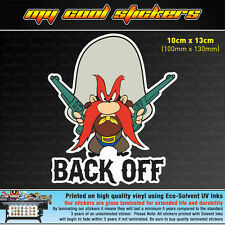 1 x Yosemite Sam - Back Off vinyl sticker/decal. Digitally printed using Eco-Solvent CMYK ink on premium quality vinyl and gloss laminated to increase the durability and life of the sticker. Waterproof UV Resistant. Trending at AU $5.08eBay determines this price through a machine-learned model of the product's sale prices within the last 90 days. Because it is printed onto opaque white bumper sticker vinyl, the circles will stay white and not be transparent. Funny Bumper Sticker. Great funny car sticker with a million uses. My stickers are printed on quality opaque vinyl which is both waterproof and UV resistant and I use top quality eco solvent inks. What can be better than a farting unicorn?. 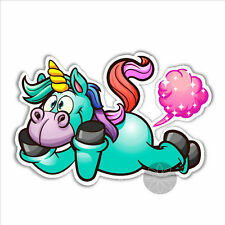 Unicorn with pink fart bubble. Funny Car bumper sticker. This sticker has a narrow white border. My stickers are printed on quality opaque vinyl which is both waterproof and UV resistant and I use top quality eco solvent inks. Strong self adhesive & slide and re-position without any trail. Material: Vinyl. With air bubble release channels. Size: 60"X20"/152x50cm. Repairs will be processed through the manufacturer, we will assist in the repair procedure in any way we can to expedite the process. NARUTO UZUMAKI CAR DECAL. Cute decal with Naruto being smooshed into the glass. Material: PVC. Easy to apply - instructions included. Size 125mm x 110mm. The next layer is the sticker itself. As you can see in the diagram the sticker consists only of the logo itself, there is no background or clear area around it. The bottom layer is the backing paper, the adhesive underside of the sticker rests on this. SQUASHED MINION CAR DECAL. Cute decal with a minion being smooshed into the glass. Material: PVC. Easy to apply - instructions included. Size: 60"x20" （150cm x 50cm ）. 1 x Sticker. Material：Self adhesive stickers. Can be applied to any clean, smooth, flat surface (walls, window, cars, mirror or fridge). Firmly affixed to the car, do not fade, do not hurt the paint.All engraving car stickers are presented transfer film.Give your car a special feeling.Renderings for reference only. Trending at AU $1.01eBay determines this price through a machine-learned model of the product's sale prices within the last 90 days. Stylish black & white graffiti patterns design. Size: approx. 150 x 50cm (60" x 20"). Material: Self adhesive stickers. Easy to remove without any residue, will not harm your car paint. Due to the light and screen difference, the item's color may be slightly different from the pictures. New Design Unicorn style. Material: Super waterproof sunscreen outdoor material. NOTE: NOT suitable for dirty or rough surface. Size: 13 11.5cm. Strong self adhesive & slide and re-position without any trail. Material: Vinyl. With air bubble release channels. Size: 60"X20"/152x50cm. Machine-Cutting, don't need to cut,again tear can stick. Super waterproof, sunscreen do not fade. 1.50 piece each bag, 50piece random Sticker. 50Pcs x Sticker. Each individual pattern size range of 5 to 12 cm. Decal is simple "Peel & Sticker" type decal. The decal can be applied to Cars, Trucks, SUVs, Trailers. Simple Peel & Sticker. Water Proof. Die cut to the exact contour of the design. New Design Unicorn style. Material: Super waterproof reflective sunscreen outdoor material. NOTE: NOT suitable for dirty or rough surface. Press the tear film after the sticker, Until flat,Don't let the car stickers and have any physical separation or protrusions. In the case of conditions, can moderate heating, to ensure that the sticker can be better and more firmly stuck in the car body. WRY NECK SUPERHEROES DECAL. Sticks to any smooth, clean surface. Basically anywhere you can think of sticking a sticker. Easy peel backing and tear resistant sticker make application easy. Size: 22cm x 4.7cm. Description: 100% brand new and high quality. Feature: Easily re-positioned and stretched for exact fitment, with air guide groove, not easy to bubble. High quality PVC material, strong extensibility, not easy to fade. Long-lasting adhension but easy to remove whenever you want to change another style. Stylish and attractive decoration, improve the exterior or interior of your car or motorcycle. Resistant to UV, high temperature, water, dirt, grease, mild acid and oil. Scratch resistant, act as a effective protector for your car. Widely applied to decorate inside and outside of the car body, motorcycle, notebooks, cell phone, suitcase, etc. Sticker Tinkerbell F#ck Growing Up in White. let us know and we will custom make it. Remove the backing (clear) from the sticker and lightly position it onto the window. Firmly push the image down using a sponge or cloth ( dry), starting at the centre and working carefully outwards, ensuring constant pressure is applied across the entire design. Our sticker is very convenient to stick on your car /vehicle,and it is quite durable.when you stick on this decal to decorate your beloved car,will make it more outstanding&personality. Material: PET. Images and videos are for reference only and do not constitute part of the conditions of sale. make Supersized seem small. YOURS MAY GO FAST BUT. I endeavour to be always ACTIVE4BARGAINS to pass on Great Value to you! UP YOURS GRUMPY CAT CAR DECAL. Easy to apply transfer decal - instructions included. The car decal is durable to heat and sunlight. 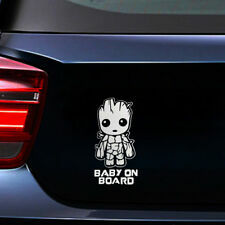 Decorate your car with personalized car decal, which made to a personlized look of your car. Remove protective film from adhesive, align carefully and then press firmly to insure proper adhesion. Size 170mm x 110mm. The next layer is the sticker itself. As you can see in the diagram the sticker consists only of the logo itself, there is no background or clear area around it. The bottom layer is the backing paper, the adhesive underside of the sticker rests on this. A mirrored pair of orange dragons. My stickers are printed on quality opaque vinyl which is both waterproof and UV resistant and I use top quality eco solvent inks. They should keep looking good outside for up to three years. MY WIFE YOUR WIFE DECAL. Clean surface and remove any dirt, oils before attaching decal. Place decal on a hard smooth surface (front side of decal facing up). Tape and secure the top of decal to surface. A beautiful retro style red rose vinyl sticker. My stickers are printed on quality opaque vinyl which is both UV and water resistant and I use top quality eco solvent inks. The stickers are sticky on the back, and can be applied to most smooth surfaces. Transfer film, stickers, pvc bottom. Uncover the transfer film, transfer film sticker should. All engraving car stickers are presented transfer film. stick to the back of the sticker has adhesive film. 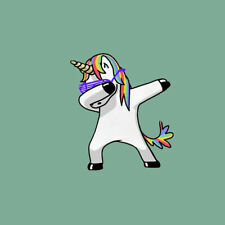 Funny vinyl sticker - Dabbing Unicorn dab. He's magical and mystical. A very cool unicorn and probably very good luck. Funny Car bumper sticker. in blue, pink and purple with a glowing fiery mane. This sticker has a narrow white border. Peeking Out Sticker Decal. You are purchasing 1 Peeking Out sticker in the colour of your choice. These are Diecut Vinyl Decal stickers. I will always try to fix any problem so you are happy. We are following their policies and guidelines on how to protect the marketplace. - Waterproof UV & Fade Resistant. - Electronic Computer Cut Decals. Need to buy bulk?. The more you buy the more you can save! Strong self adhesive & slide and re-position without any trail. Specification: Material: Vinyl. With air bubble release channels. Size: 60"X20"/152x50cm. Repairs will be processed through the manufacturer, we will assist in the repair procedure in any way we can to expedite the process. ROCKET DECAL. Clean surface and remove any dirt, oils before attaching decal. Place decal on a hard smooth surface (front side of decal facing up). Tape and secure the top of decal to surface. DO NOT remove the application tape. A panda skilled in martial arts, particularly kung fu. funny car bumper sticker / decal. I print my stickers are printed on quality opaque vinyl which is both waterproof and UV resistant and I use top quality eco solvent inks. Quantity: 60pcs. 60pcs include different shape stickers. Windproof, waterproof and durable car stickers. Product Type: Car Sticker. Occasion: Car Body. 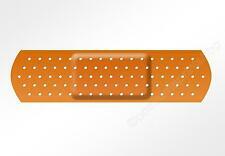 Easy install, just peel the backing and apply to any smooth surface.